The day we decided to go to Little Italy was Good Friday. Traditionally we refrain from being carnivores that day. (Perhaps in the hope of a little more in terms of redemption). I was going to be a vegetarian for the day and decided to do it in a little style, why not try an Italian vegetarian joint. It came recommended and so we decided to see for ourselves. Little Italy is on 100 ft road Indiranagar and is not all that difficult to find. They have an AC section and baby chairs as well. We were four, all of whom were vegetarians for the day. For starters we ordered the "Assorted Bruschetta", which should have been an inkling of what was to come. Bruschetta in its original toasted bread on which you rub a pod of garlic, half a red cherry tomato, add on a sprinkling of olive oil and DEVOUR. Of course, through time, there were several variations which all emerged from American kitchens, thanks to their penchant for robbing original ideas and bastardising them. 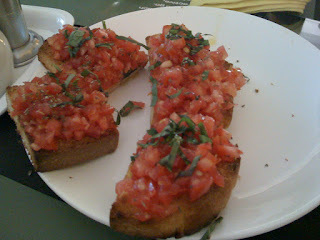 So the Assorted Bruschetta that arrived was actually just one version, bread, with chopped and seasoned tomatoes on it. My honest opinion was that it was like eating bread with tomato gojju on top. Another starter was the cheese and corn balls which came served with salsa. Here I must say that the salsa was so good that we ordered another round of it. 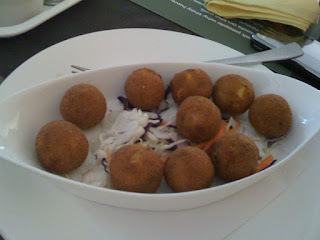 The cheese and corn balls were hot, bland and had a casing of mashed potato. Pure veggies - you guys will love this - though a dash of jalapeno would have been great. Next came the main courses. 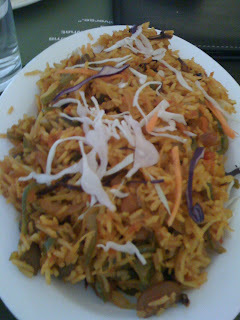 I am a sucker for good risottos and I can swear by those served at Bangalore Bistro and Fiorano Ristorante. 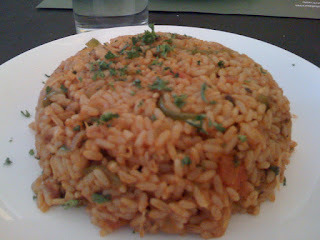 And so I ordered the Risotto with a tomato base, which promised the sky in the menu, but what finally came was south indian boiled rice made with tomato gojju (looks like they have an overdose at this place). 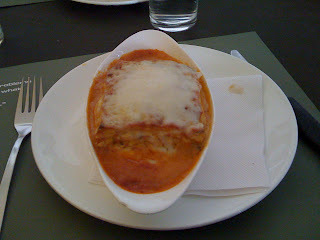 Sudhakar ordered the lasagne which was so-so. The cheese was excessive but in the end it was among the better things on the table. Pavan ordered the ravioli with spinach sauce which was quite ok and Preethika the Veg Quesadilla which is originally supposed to be served with guacamole but which came with sour cream, which turned out the be regular cream. 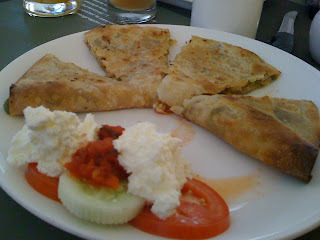 The Quesadilla is supposed to be served in tacos, but what came was in paper thin chapatis, and were not the ideal substitute. We also ordered a mexican rice for Anoushka but she found the garlic bread more interesting. and so when Sudhakar did finally have it, the verdict was the it was ok. What really did go down well with us was the drinks we ordered. Preethika went for the mango shake was the house special, it came nice, cold and totally pulpy. You may want to ask for more sugar here. I ordered the Pink Dwarf, which was a strawberry and kiwi shake, there was actually a slice of kiwi in there and it was awesome. 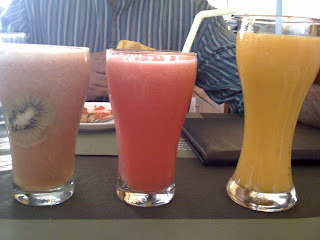 Sudhakar ordered the Zip Zip, which was watermelon and litchi and was equally great. Overall the meal would be considered great by pure vegetarians who have not tasted the meaty versions of what is served here. Also the risottos should be taken of the menu since these people are using the poor man's version of the original arborio rice (which by the way is not difficult to get in Bangalore). The restaurant seems to go on the funda of serving traditional south indian food in the guise of Italian which is a tad unfair when the final bill for 4 came to Rs 2400.